Sgt. Michael Stokely was killed in action in Iraq just a week before my son Noah was wounded. I have always felt a kinship with Sgt. Mike as he and I share a birthday. I add a candle to my cake and wish Mike Happy Birthday every year; a birthday present in his name goes to a soldier-related charity. His life and his passing are worth remembering. It is three years in just a few days - August 16. This [Saturday], at 11:30 A.M. edt, it will be three years since I last talked to him and the last time I heard him say "I love you dad" - in a lot of ways, that is almost as tough a day for me as the day he died, the day I met his body by myself at the Airport and the day he was buried. So, I have four tear at my heart days coming up in the next three weeks - August is always a tough month for me and will be rest of my life. But, we will carry on and we will Remember Mike with Honor by helping others have a better opportunity at education and life, whether they be local students or children in Yusufiyah Iraq. Robert, has honored his son by establishing the Mike Stokely Foundation (read more here). Stacy has a great video tribute to Mike up at her blog... take a look. Our thoughts and prayers are with the Stokely family today (as always). Thanks for posting the links, Carla. A very moving tribute by his sister. Our thoughts, prayers, and gratitude to the Stokely family. Lovely photo with Collin and the glorious sunset! Saw the one over at Doc's site as well. So nice to see the big smiles! Robert and his family have been on my mind all day today. My soldier was home on R&R when Mike was killed and when Noah was injured. I will never forget that R&R because of those two events. Strange how you are reminded of certain things in life. Each year at this time I reflect back and think of how happy I was to have my soldier home safely with me, but the Stoely's and your family were facing such an emotional time. Robert Stokeley is an amazing man. And you're pretty amazing yourself, Carla. Think of all the people you have helped by having this blog. God love ya. You and Noah and the little guy are in my daily prayers. I was supposed to be on a happy PGR mission up in Phoenix tonight, but woke up with a sore throat and a fever, so I've been resting all day. THANK YOU for remembering and honoring Mike Stokely. It is a special privilege of sacrifice our family bears, one we did not want, but then if not borne by us, then who should we expect to bear it for us? DUTY HONOR COUNTRY - words Mike loved and lived by. John 15:13 - No greater love than a man will lay down his life for another - words Mike demonstrated in his last act of sacrifice. I could always count on a great read here. 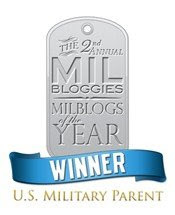 Thank-You for this story, your blog and being some soldiers Mom who decided to keep a journal. 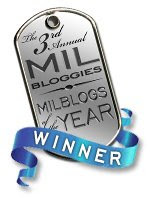 All military bloggers have helped win this war. Hooah!